Living a brave life is not always easy. We stumble and we fall. 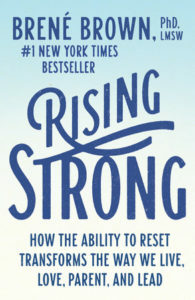 It is the rise from falling that Brené Brown takes as her subject in Rising Strong. Brown has listened as a range of people – from leaders in Fortune 500 companies and the military to artists, couples in long-term relationships, teachers, and parents – shared their stories of being brave, falling, and getting back up. She asked herself, What do these people have in common? The answer was clear: They recognize the power of emotion and they’re not afraid to lean in to discomfort. The process of regaining our footing in the midst of struggle is where our courage is tested and our values are forged. We reckon with our emotions and get curious about what we’re feeling; we rumble with our stories until we get to a place of truth; and we live this process, everyday, until it becomes a practice and creates nothing short of a revolution in our lives. 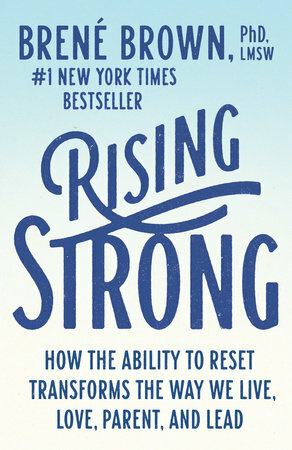 Rising strong after a fall is how we cultivate wholeheartedness. This process teaches us the most about who we are.